Maurice "Blondie" Denning, once an Iowa farmer, found his way onto the wrong side of the law at age 23. He later became a well-known bank robber in the Gage County area in the 1930s. 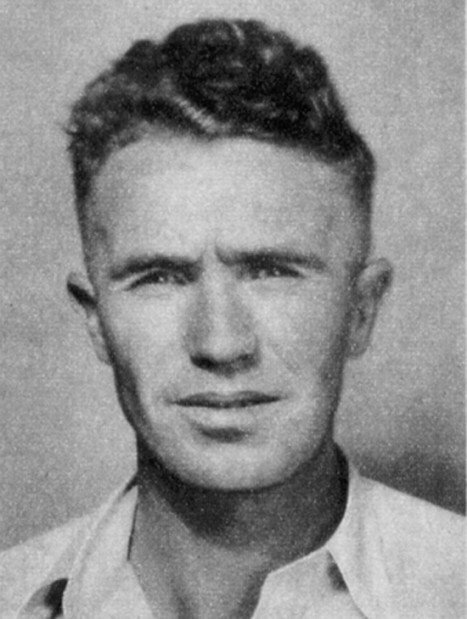 Thomas Limerick, a onetime boxcar bandit, became a "public enemy" bank robber in the Gage County area in the 1930s. A 1934 Beatrice Daily Sun headline and story tell of a raid in the little town of Kinney that resulted in the death of one bandit, wounding of another and the capturing of several more. A 1934 Lincoln Star page with photos tells of raid on a Kinney home where "public enemy" bank robbers were hiding out. On a chilly night in late November 1934, a few days before the first snowfall, 18 lawmen closed in on a two-story house in Kinney, seven miles east of Wymore. Kinney at one time had been a bustling railroad town. By the '30s, it was little more than a grouping of buildings along the railroad. Its desolation made it the perfect hideout for a gang of bank robbers who had scoured banks, personal pocketbooks and National Guard armories in the Midwest during the early 1930s - a period that would later become known as the Public Enemy Era, dominated by figures such as John Dillinger, Baby Face Nelson and Pretty Boy Floyd. While the exploits of J. Edgar Hoover's Public Enemies dominated newspapers and airwaves during the time, Gage County saw four public enemies come and go in the same style as Dillinger: flashy cars, expensive clothes and narrow escapes amid a hail of gunfire. The gang that holed up in the two-story Kinney home had been brought together by coinciding jail stays. Maurice "Blondie" Denning, once an Iowa farmer, found his way onto the wrong side of the law at age 23 when he was fined for using stolen license plates on his car. Denning's wife, Alice, described her husband as never satisfied with the money he had been making. On Oct. 23, 1933, he was arrested in Council Bluffs for bootlegging. The 60 days he spent in prison would be the only time he ever served behind bars. According to Brian J. Beerman, who has conducted extensive research on bank robbers of the time, Denning hooked up with another bank robber, William "Billy" Pabst, and his partner, Earl Keeling, while serving his sentence in Sioux City, Iowa. Soon, Pabst's 20-year-old nephew, Francis Harper - an escaped convict from Joliet, Ill. - and boxcar bandit Thomas Limerick - whom Denning had worked with on a farm years before - joined the gang, and their spree of heists across the Great Plains began. Early on, the Denning-Limerick gang burglarized the Omaha and Council Bluffs area before joining the big leagues, plundering a National Guard armory on Aug. 23, 1934, "taking pistols, rifles and other equipment," according to Beerman. Now well equipped for their task, the gang would go on to rob banks in Hawarden, Iowa, Dell Rapids, S.D., and Superior, Neb., their largest, during October and November 1934. Shortly after the Dell Rapids job, the gang began hiding out in Kinney, already well on its way to becoming a ghost town. Their apparent connection to the area was an Odell banker, Charles N. Hinds, who had sold stolen bonds given to him by the gang to a broker in San Antonio. Another Odell man, Hugh Berry, rented his house in Kinney to the gang starting late September or early October 1934. Berry, who had been running a dice game in the house, required 25 cents an hour, which the gang was more than happy to pay. From Kinney, the Denning-Limerick gang made plans. Their next target: the Security National Bank in Superior. According to the Superior Express newspaper, "Three unmasked bandits armed with revolvers and a submachine gun robbed the Security National bank of all its cash on hand ... $7,929.15 was taken." Shortly before 4 p.m. on Nov. 22, three members of the gang forced all employees and customers into a back room where they waited for the timed vault to unlock itself. 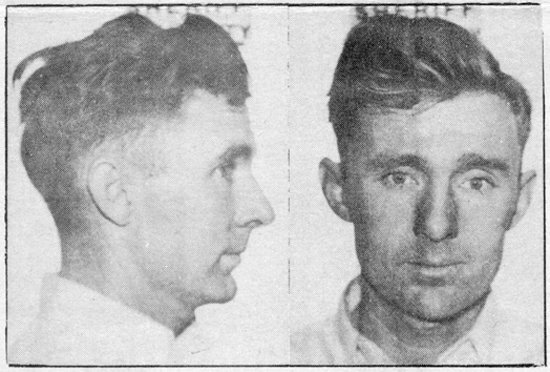 The Express reported that during the escape, the bandits took cashier Paul Schmeling and bookkeeper George Whitney as hostages and made them ride on the runningboards of the getaway car, acting as human shields until they were well outside of city limits, similar to tactics used by the Dillinger gang. As word of the robbery spread, Gage County officials already had an idea who was behind the spree. Elected in 1928, Gage County Sheriff Thomas Dunn already had been trying to clean up the county before the showdown at Kinney. Dunn had seen the number of Prohibition-prompted arrests and convictions grow by the year. And "Dunn's Mansion," as the county jail had come to be known, was never short on tenants. In September 1934, Dunn received a report that a group of "suspicious characters" had taken up in Kinney. The group, reported as several men and just as many women, would spend their days shooting at small game around the area and spending money without worry in the local markets. Before heading to Kinney, Dunn recruited Beatrice and Wymore city police, state sheriff's deputies and special investigators to aid in the raid. Dunn even deputized Beatrice residents Drew Jamison, Carl Fike, Earl Mudge and Tim Sullivan. As it turned out, only two of the suspects, Earl Keeling and Francis Harper, were actually in the house as the lawmen approached. Having just pulled off the Superior robbery the week before, both men were preparing to marry their sweethearts the next day in Marysville, Kan.
Over a dinner of rabbit stew, the two men and four women in the house had no idea the law had finally caught up with them. With his officers in place, Dunn ordered the men to surrender themselves in the next 15 minutes or officers would storm the residence with guns and tear gas. Dunn's deadline was near as Keeling and Harper finally exited the house. The Liberty Journal reported the two men walked 50 feet from the house with their hands up before making a dash for a field across the road. The officers' guns began firing without hesitation. Keeling was hit almost immediately, a bullet tearing through his back and exiting below his liver. The robber continued half a mile more before collapsing in a ditch. The Wymore Arbor State reported Keeling was treated briefly on the scene before being taken by ambulance to Lutheran Hospital in Beatrice, where he died the next morning. Harper's luck held out a little longer. The 20-year-old was grazed by a bullet in his hip, but was not seriously injured. Making his way north and west, Harper flagged down an oil truck driven by 29-year-old George Siems of Beatrice. Forcing the driver at gunpoint, Harper traveled through Beatrice to a stretch of road one mile south of Pickrell. There, the fugitive had Siems pull his massive truck crossways over the road as a doctor and his wife happened by. Forcing the couple out of their car, Harper continued north until he was out of sight. In Mt. Sterling, Ky., he ditched the doctor's car and abducted Morehead College agriculture professor Henry Haggan and his 8-year-old daughter. Harper later left them on the side of the road. Back in Kinney, Hugh Berry, who had been renting the house to the gang, arrived a half-hour after the raid and surrendered. He admitted to running a dice game as well as bootlegging, and was transferred to "Dunn's Mansion," charged with harboring fugitives. He was convicted and served six months. The four women arrested at the Kinney house - Alice Denning, Catherine Limerick, 18-year old Theola "Babe" Giermann and Nellie Likens - were charged with harboring fugitives. The state dropped their cases, and they were freed. Among the items found in the house were a guitar and country music books that Harper had used to woo over Giermann in the two weeks the gang spent at the house. A car matching the description of the getaway car from the Superior robbery was discovered in an abandoned garage behind the house. Investigators seized about $2,800 from the house, stuffed into door partitions and tucked away in pillows, along with $900 hidden away in a broken radio. The house was described as "an arsenal" of weapons, including some stolen from a National Guard armory in South Dakota. Three army rifles, two sawed-off shotguns, several automatic pistols and 1,500 rounds of ammunition were confiscated. Denning and Limerick arrived in Kinney around midnight in a car they had stolen hours earlier. Finding the area guarded by officers, they ignored the order to halt, speeding through a flurry of gunfire and into the night, eluding capture unscathed. Their stolen car was found Dec. 4, 1934, in an abandoned barn near Odell. Bullet holes were visible in the gas tank and above the rear door. There was no sign of Denning or Limerick. Reports came in over the next several days of possible sightings in Omaha and farther east in Iowa, but nothing was known of their whereabouts until a Jan. 5, 1935, robbery of a bank in Hudson, S.D. According to Beerman, Limerick finally was arrested following a fight in a nightclub in St. Joseph, Mo., on May 25, 1935. He confessed to robbing banks but never named any of his associates. He was sentenced to life in prison in Leavenworth, Kan., and was later transferred to Alcatraz. On May 23, 1938, he was killed trying to escape from Alcatraz. Denning was never seen nor heard from again in Nebraska. On July 20, 1936, FBI Director Hoover named Maurice Denning Public Enemy No. 1 after the death of Dillinger associate John "Red" Hamilton. Staying on the FBI's radar until the 1960s, Denning was never apprehended, making him the most successful Public Enemy. Kinney briefly regained the public spotlight after the raid on the gang's hideout. As news of the raid spread, curious visitors began arriving to see the scene. Eventually, the town became deserted. The buildings were razed not long after. Nothing remains except a path through which the railroad used to run and the legend of Gage County's brush with the public enemies.